Luke 19:28-40 Jesus arrives at Jerusalem as Messiah, fulfilling prophecy. Isaiah 50:4-9a God’s servant, though insulted, is faithful, and not disgraced. Philippians 2:5-11 Jesus, after his supreme humility is supremely glorified. Luke 22:14-23:56 The full story of Jesus’ final hours. This depiction just hints at the excited crowds, and as a static image, it can’t convey the noise. 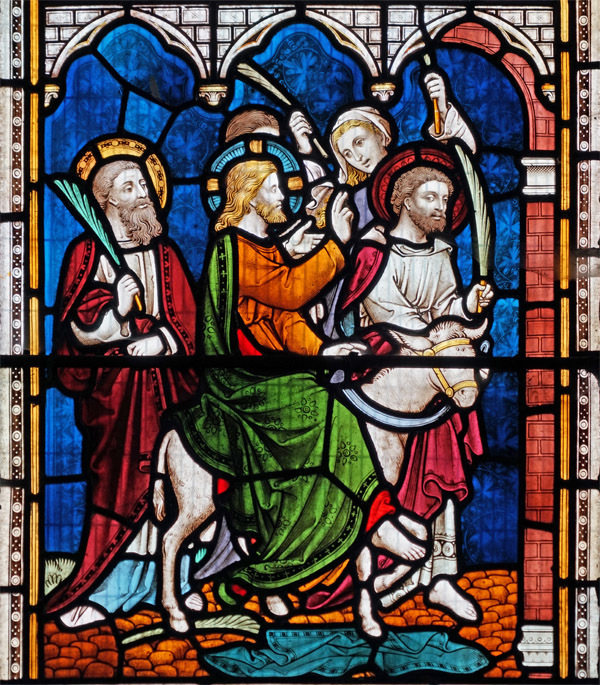 Knowing what was ahead of him, does this cheerful Jesus (and donkey) seem likely? How would we be feeling in Jesus’ circumstances? – Jesus’ mode of arrival in Jerusalem, in fulfilment of Zechariah 9:9, was not spontaneous. He knew people in Bethany, including Martha, Mary & Lazarus, so had presumably arranged the donkey in advance. – Seen in isolation, it’s easy to forget that the “Philippians reading” is from a letter, written to a group of people whom Paul knew and loved. It is set in a passage about living together in harmony, with love and compassion. It’s even more moving when we recall that Paul himself was writing from prison. – Try reading the entire Passion narrative in one go. We so often hear short extracts, but immersing ourselves in the story brings it home more powerfully. Isaiah 42:1-4, 49:1-6, 52:13-53:12 The other three ‘servant songs’ are worth reading in Holy Week to reflect on their fulfilment in Jesus’ life and ministry. Psalm 118 In Luke 19:38, the crowd are ‘quoting’ this psalm, which is a celebration of God’s victory over Israel’s enemies. Esther 4:9-16 Esther agrees to place herself in mortal danger for the possibility of saving the Jews from the plot to exterminate them. Acts 3:1-10 The “name of Jesus” brings healing to a paralysed man. • Give thanks for the freedom we enjoy to celebrate Easter, and for the faithful witness of so many who do not have that freedom. • Pray for the staff of all our village schools – that they would get time for proper rest and recreation before the long summer term to come. • Pray that Easter will spark the desire to come to church, even in people who don’t normally. Pray that they will hear and receive the Gospel. • If you haven’t yet bought your Easter eggs, consider buying the Real Easter Egg from meaningfulchocolate.co.uk (available online or in supermarkets). • Beyond Easter, think about how you & your church will be supporting the Thy Kingdom Come prayer week: http://www.thykingdomcome.global/ .